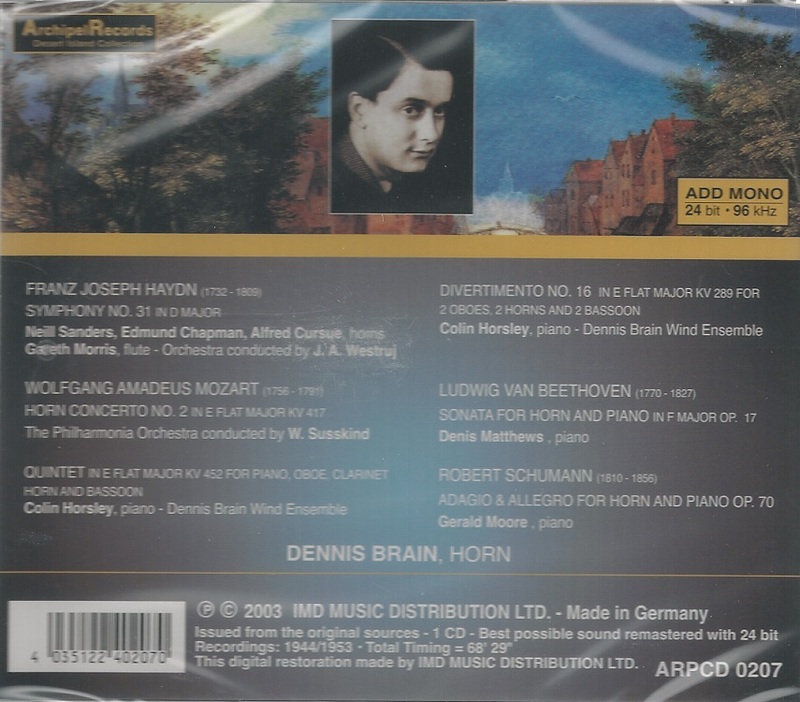 “Few instrumentalists of the twentieth century did more to establish a solo rôle for an instrument than Dennis Brain. By age 36, he had helped restore the four Mozart and two Strauss horn concertos to the repertory, inspired Hindemith, Britten, and others to write for his instrument, and generally set the standard for twentieth century horn soloists. Born in 1921, Brain was raised in a London horn-playing family. Both his father, Aubrey Brain, and his uncle played professionally, as did their father, Alfred Brain Sr., himself the son of a horn player. (His other brother, Leonard, was a noted oboist.) In 1936, he began studies with his father at the Royal Academy of Music, and two years later made an acclaimed London début as a soloist in Bach's Brandenburg Concerto #1 with the Busch Chamber Players. Brain soon became a frequent soloist with the Royal Air Force Central Band, with which he filled the position of principal horn during World War II. His growing reputation was cemented during a goodwill tour of America, during which he received an invitation from Leopold Stokowski to join the Philadelphia Orchestra after the war. This was just one of several invitations that Brain received, however, and he eventually took the job of principal horn with the Royal Philharmonic. Later he moved on to become principal horn of the Philharmonia Orchestra. 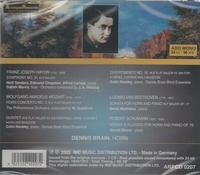 All the while, Brain was a sought-after horn soloist and chamber musician. During the postwar years, he made a series of now-classic recordings of concertos by Mozart, Strauss, and Hindemith, as well as of various chamber and recital works. 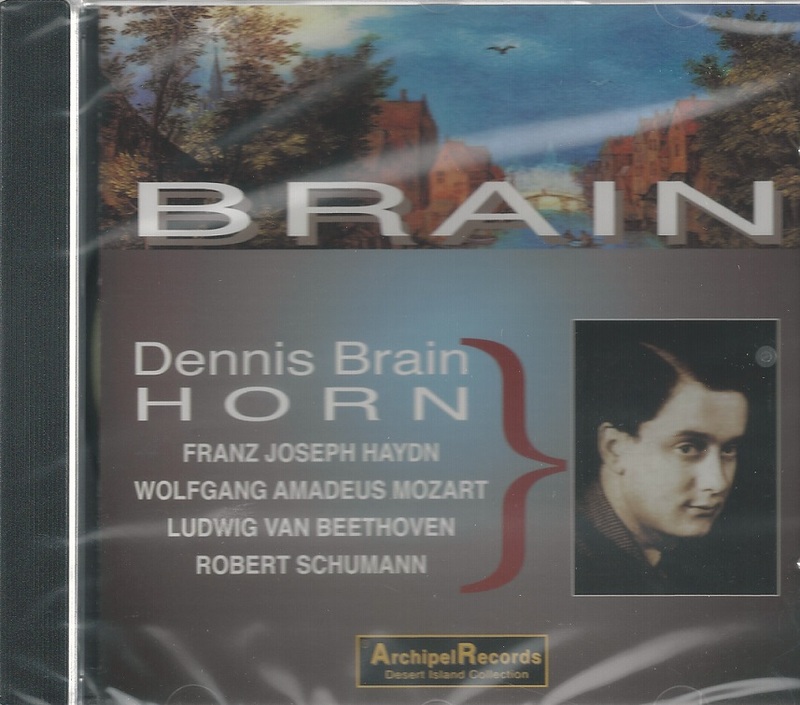 Among the additions to the horn literature directly inspired by Brain were works by Britten, Hindemith, Malcom Arnold, and Gordon Jacob. His virtuosic command of the instrument stimulated two of Britten's greatest chamber works, the Serenade for Tenor, Horn and Strings (1943) and the Canticle III (1953). Brain took up conducting as well and founded a wind quintet that won him considerable fame. It was following a concert by this quintet at the Edinburgh Festival on 1 September, 1957, that Brain was killed in a car accident on his way back to London. Benjamin Britten has written of that fateful night that ‘it has robbed us of an artist with the unique combination of superb technical command of his instrument, great musicianship, a lively and intelligent interest in music of all sorts, and a fine performing temperament, coupled with a charming personality’."